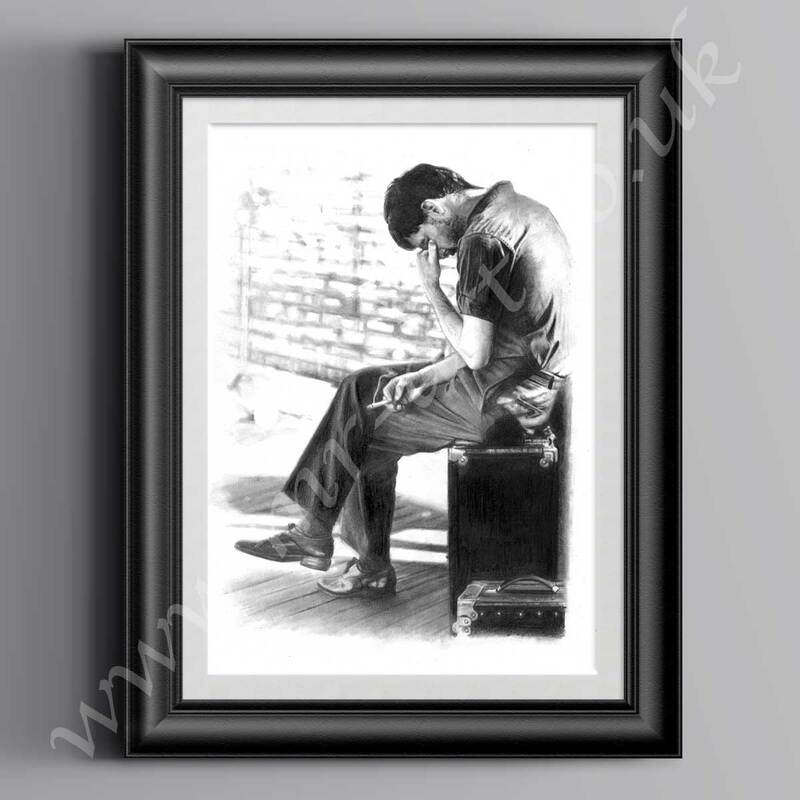 This exclusive Ian Curtis Isolation print has originally been drawn in pencil by Mark Reynolds. Ian Kevin Curtis (15 July 1956 – 18 May 1980) was an English musician, singer and songwriter. He is best known as the lead singer and lyricist of the post-punk band Joy Divison. Joy Division released their debut album, Unknown Pleasures, in 1979 and recorded their follow-up, Closer, in 1980. Curtis, who suffered from epilepsy and depression, committed suicide on 18 May 1980, on the eve of Joy Division’s first North American tour, resulting in the band’s dissolution and the subsequent formation of New Order. Ian Curtis was known for his baritone voice, dance style, and songwriting filled with imagery of desolation, emptiness and alienation. In 1995, Curtis’ widow Deborah published Touching from a Distance: Ian Curtis and Joy Division, a biography of the singer. His life and death have been dramatised in the films 24 hour party people (2002) and Control (2007). Ian Curtis’ last live performance was on 2 May 1980, at High Hall of Birmingham Universit, a show that included Joy Division’s first and only performance of “Cememony“, later recorded by New Order and released as their first single. The last song Ian Curtis performed on stage was “Digital”. The recording of this performance is on the Still album.